Growing Asparagus Peas (not quite the same as the Asian Winged Bean)... | Grow Your Own Veg Blog. Gardening and Food Blog. A bean emerging from its stem is not normally something that one writes home about, but it is the frills on this particular one that makes it rather a unique and peculiar sight. Unlike ordinary peas or beans, the Asparagus Pea has four sides, and each of these has a delicate and pretty frilled edge. 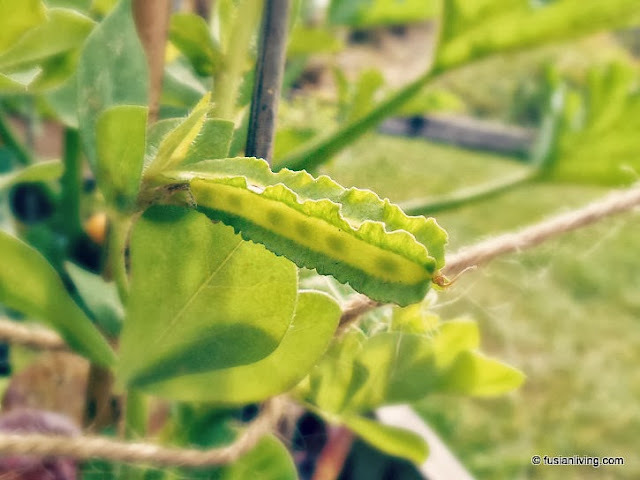 It is the first time that I have successfully grown this variety of pea. Last year, the seeds failed to germinate, and this year, only two out of six seedlings have made it far enough to flower and produce pods. I can't help but admire the dainty little flowers - deep crimson and so pretty, I want to pick them all and bring them into the house. In a different part of the world, frilly peas (or beans) are not as much of a curiosity as they might be over here. In many parts of Asia, the very similar Winged bean (or Four Angled Bean, "Kacang Botol", 四角豆) is commonly sold in wet markets and vegetable stalls all year round. The Asian Winged Beans are a different plant to the Asparagus Pea. 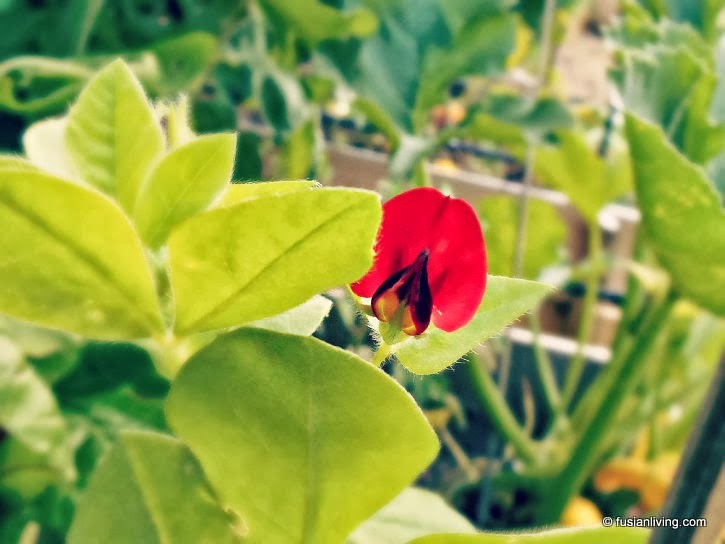 They are a climbing plant with long pointed leaves, whereas the Asparagus Pea plant is a small shrub with rounder leaves. The Winged Bean plant also produces pale blue flowers, and the pods tend to be larger. It would seem that the pods could probably be eaten in the same way, although the Asparagus Pea pods are so tiny, it makes you wonder whether it is worthwhile. In Malaysia, the Winged Bean is a much loved crunchy bean that is stir-fried with chillies and "belacan" (dried shrimp paste), to make one of the country's most popular spicy vegetable dishes. And in Thailand, finely diced winged beans are drenched with a dressing made from tamarind, palm sugar and coconut milk and served as a salad. The bean itself features as the main ingredient in these dishes, signifying the appreciation of this bean by locals.